Nearly 100 people ventured out on a frigid Friday evening to hear Mark Siegel speak about the evolution of graphic novels, tracking the key developments in France, Japan, and the U.S. which combined and culminated in his unique and successful vision for First Second Books. Slovenian award-winning poet Aleš Šteger gave a stirring reading from his first volume to be translated into English, The Book of Things (BOA Editions, translated by Brian Henry), to a rapt audience this lovely spring evening. Surrounded by philosophy and theoligian texts, Šteger discussed the difficulties and rewards of translating his poems into English, offering a few readings in his native language. Read a review of his book here! An eye-opening, multi-media presentation of erasure poetry by three skilled practioners (and one surprise guest!) wowed the crowd, with Travis Macdonald reading from O Mission Repo, an erasure of the 9/11 Commission Report; Janet Holmes read from The Ms of My Kin (Shearsman), an erasure of The Poems of Emily Dickinson; Eric Lorberer read "Lessons of the World," an erasure of portions from the 1919 book Lessons of the World War; and Matthea Harvey read Of Lamb, an illustrated erasure of a biography of Charles Lamb. If you missed this excellent event, CLICK HERE to view the Walker channel webcast! Poet and critic Daniel Tiffany read from his books of poetry, Privado (Action Books) and The Dandelion Clock (Tinfish Press) on a blustery Sunday evening. Poet Ravi Shankar read selections from his books, including his new book Deepening Groove. 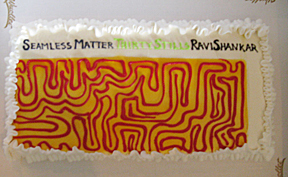 He also read a large selection from his chapbook, Seamless Matter, published by Rain Taxi's OHM Editions and later enjoyed in a cake version. CLICK HERE to view a video of Shankar discussing the lovely cover of this chapbook by renowned artist Sol LeWitt! featuring JIM WOODRING, Bedtime Stories, and more! Held as part of the Northern Spark arts festival, NIGHTSHIFT offered a dazzling all-night tour of oneiric art. For our special midnight presentation, famed cartoonist Jim Woodring commanded the attention of a huge crowd of nightowls, insomniacs, and revellers with his 7-foot pen, inking a drawing of a severed frog's leg. Click here for video of this landmark event! Local comic artists Zander Cannon and Zak Sally assisted Woodring as he undertook the task, and when the drawing was completed Woodring let local artists try out the Giant Pen. 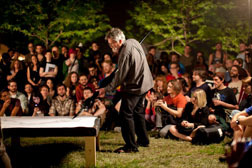 Other activities at NIGHTSHIFT included Skyspace Headphone Concerts, Marcus Young's Lullaby Project, and The Shape of Night, where people took part in choreographed sleep positions. The Drawing Nightclub made some nocturnal works and a bevy of local writers offered Bedtime Stories (originals and night-inspired classics) until the first light could be seen on the horizon. Readers included Will Alexander, Ute Bertog, Paula Cisewski, Gabrielle Civil, John Colburn, Valerie Deus, Gary Dop, Kelly Everding, Catherine Lundoff, Abby Travis, and Becky Weaver. NIGHTSHIFT was cosponsored with us by the Walker Art Center and mnartists.org, two indispensable loci of the arts scene in the Twin Cities. Thanks to them, and to all who stayed up late with us! Craig Thompson spoke to over 330 people at MCAD, discussing the process of creating his new book, Habibi, just published by Pantheon. Thompson presented images of pages from his book, showing the painstaking development from draft to finished product, which resulted in the richly decorative and expressive art and story that comprise this 600 page graphic work. Thompson is also the author of Blankets, Good-bye, Chunky Rice, and Carnet de Voyage. Fans flocked to hear Pulitzer prize-winning poet James Tate read his deliciously funny and dark poems published in the Rain Taxi Brainstorm chapbook The Zoo Club. They were also treated to an amazing poetry reading by surprise guest Dara Wier who warmed up the crowd before Tate took the stage. If you missed it, CLICK HERE to see the recording of this fantastic night. This year’s fantastic lineup included Diana Abu-Jaber, N. M. Kelby, Jaimy Gordon, Daniel Woodrell, scientist Steven Pinker, cartoonist Ben Katchor, actor Kevin Sorbo, biographer Gary Tillery, essayist Lawrence Weschler, and many other great authors! Click here for more highlights! We ended our 2011 Reading Series with a bang as a near-capacity crowd braved the first hints of winter to hear poet Anne Carson read from her work. Anne Carson appeared in conjunction with the Walker’s presentation of Big Dance Theater's Supernatural Wife, an adaptation of Euripides’s Alkestis using Carson’s translation. Anne Carson read a gripping new prose piece about a blood splatter specialist, translations of poems by the Roman poet Catullus, and selections from her recent elegaic book, Nox. CLICK HERE to see the recording of this wonderful event.